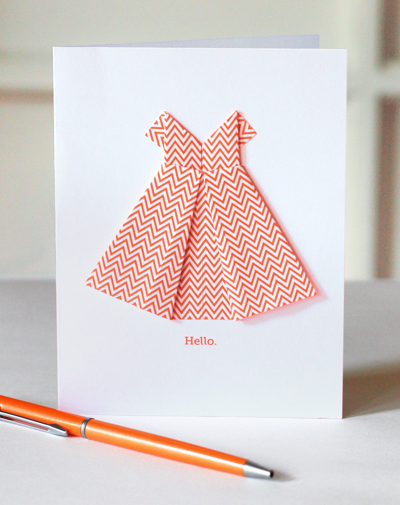 A simple origami dress makes a sweet DIY greeting card. It's a good option for Mother's Day, bridesmaids and bridal showers, or birthday cards for fancy ladies. I made a quick chevron pattern in Illustrator and printed it on computer paper, then folded this little frock from a 4-inch square. I printed a greeting on plain cardstock and attached the dress with double-stick tape. Using a map or old book pages would be nice, too. Follow this video to learn how to fold the origami dress. You have read this article cards / origami / paper with the title Make an origami dress card. You can bookmark this page URL http://jenkrebs.blogspot.com/2012/05/make-origami-dress-card.html. Thanks! No comment for "Make an origami dress card"